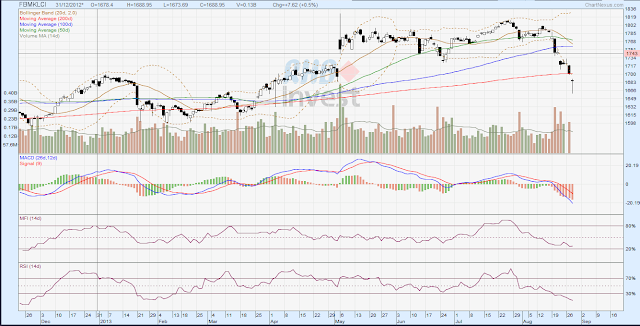 KLCI Extreme Bleeding, An Opportunity In A Crisis 2013? The much desired relief the 'inverted hammer' has appeared today. KLCI has lost like 120 points from the top of 1,800. Majority of counters have lost significantly and touch new lows for the year. Gold & crude oil + palm oil is now on the rise again since the US is on another war-path AGAIN. This time it is against the Syria regime. This bleeding is the most significant downtrend for the year. Alot of smart money are waiting to buy cheap. People like @maveric will be greedy when the fear is high since this will be the opportunity to buy low..lol. The problem is when? I found something interesting on the inverted hammer phenomenon. Will send out in 1-2 days to those in my email subscription. Like the rest of other normal homo sapiens reaction,we would of course term this as a great opportunity to achieve a part of our financial objectives ...hopefully not accounting too much of other people/stock punters miseries currently...! KLCI has gone up by 14 points as I am posting this. Well...the 'authorities' couldn't let it continued slipping for obvious reason. EPF is the biggest investor in KLCI and today's rise could be its financial power display to prop up things..! The above just mean that members would not be able to exercise the 'EPF-Member Investment Scheme'sooner as the base is raised to RM196k from the present RM120K..next year & EPF gets to conserve more funds resulting from this..! Looking forward to your inverted hammer phenomenon. If need be,I can loan you a plier,screwdriver,steel rule,chisel and what-nots to make you task easier....Ha3:D:D..! Well, investing in stocks is not about being greedy. It is about growing and protecting your wealth throughout your life. I think next year our Government will issue more NEW sukuks bonds to get money from the rakyat to fund the country. Currently EPF is used to bailout alot of troubled companies, something similar to what happened to the US. Public funds are used to save private owned debts. Well, I think EPF do have its limit to bolster the KLCI. Since the election year has pass, there is no much incentive to keep the feel good market sentiment going forward. I was surprised also about the inverted hammer phenomenon. Nevertheless, it is a good strategy to apply in the market. You want to help me? Not sure whether you want to loan me your millions to invest..lol. In crisis, there is opportunity. We just need the correct strategy and game plan. With the recent petrol increase, life is going to get harder! !